Here is the latest installment of New Zealand Dance News! The Nelson Arts Festival 2015 takes place this month, from October 14-26. ‘Just Bros’ instructors Chris Ofanoa and Tupua Tigafua from The New Zealand Dance Company. Photo by John McDermott. Graduating from a collection of activities to support the World of Wearable Arts, Nelson’s Festival is now a two-week spectacular filled with local, national and international acts. Out of the Box is an energetic fusion of hip hop and contemporary dance featuring internationally recognised dancers and choreographers. The charming Java Dance Company will also be presenting their dance theatre show, The Wine Project. The community will be blessed with a variety of exciting showcases, workshops and activities. For more information, visit: nelsonartsfestival.co.nz. InterACT Disability Arts Festival will be happening in Auckland from October 21-23. This annual event delivers a three-day festival involving New Zealand and international leaders in the field of Disability Arts, providing an opportunity for diverse people to perform, connect and celebrate. The festival involves live performances, art, drama, drumming, singing, film-making workshops, drop-in arts activities, wearable arts parades and much, much more. For more information, visit: interacting.org.nz. The New Zealand Dance Company has just presented YEP! SPRING SCHOOL JUST BROS! 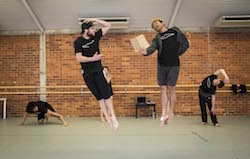 Following the success of The New Zealand Dance Company’s (NZDC) premier season of Lumina, the company brought a new Seasonal School just for boys. The Youth Engagement Programme (YEP) Spring School “Just Bros” was open to male dancers of all abilities aged 11 years and older, and offered an inspiring five full days of dance and play. Royal New Zealand Ballet dancers Tonia Looker and Harry Skinner in ‘A Midsummer Night’s Dream’. Photo by Stephen A’Court. NZDC’s dancers Tupua Tigafua and Chris Ofanoa led the boys throughout the week, with classes in contemporary, hip hop and fusion. The students were also involved in exploring their own creative ideas and developing their own work. 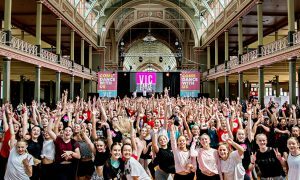 The YEP Spring School Just Bros was five days of high energy, high fun, movement exploration and dance, finishing with a performance for family and friends. 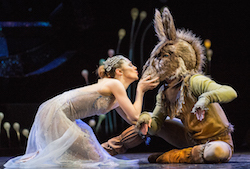 The Royal New Zealand Ballet (RNZB) has a major hit on its hands with the acclaimed production, The Vodafone Season of A Midsummer Night’s Dream. The brand new ballet by 29-year-old British choreographer Liam Scarlett, one of the most sought-after choreographers in the world today, won over critics and audience members alike. The national tour of the ballet boasted the RNZB’s largest-ever set and stunning costumes created by New Zealander Tracy Grant Lord and enchanting lighting design by American Kendall Smith. A co-production between the RNZB and Queensland Ballet, A Midsummer Night’s Dream, was the RNZB’s last production of 2015. New Zealand School of Dance (NZSD) students will perform at several locations throughout the country during October, leading up to Graduation Season. Venues include the Tempo Dance Festival on October 13-14, Kokomai Festival on October 16 and Expressions Arts and Entertainment Centre on October 23-24. The year will end with the school’s Graduation Season, November 18-28, with works that include The Grand Pas from Paquita, George Balanchine’s Tarantella, As it Fades by Kuik Swee Boon, original works by NZSD graduates, and Sir Kenneth MacMillan’s Concerto. For more information, visit www.nzschoolofdance.ac.nz/events. Dance Aotearoa New Zealand (DANZ) is hosting an Intellectual Property, Contracts and Copyright Seminar on October 21 from 5:30pm to 7:30pm. Held at the Toi Poneke Arts Centre, Wellington, the seminar costs just $5 to attend. Black Grace ‘Studio’. Photo by Neil Ieremia. Black Grace will bring the large-scale new work Siva to the ASB stage for two shows only on November 6 and 7. Created especially to mark Black Grace’s 20th anniversary and inspired by iconic Black Grace works such as Minoi, Surface and Vaka, Siva – which is Samoan for “dance” – is a percussive and strikingly beautiful work, rich in imagery drawn from our collective consciousness, re-imagined and re-contextualised in acknowledgement of our ever-changing world. Siva plays at the ASB Theatre, Aotea Centre, November 6 and 7. Tickets available via www.ticketmaster.co.nz. National audiences can join Black Grace’s 20th anniversary celebrations. The company will present a national tour called 20 for 20; Kaitaia to Oamaru, November 10 through December 7. 20 venues, $20 tickets at the door. For more information, visit www.blackgrace.co.nz. Photo (top): Black Grace ‘Underwater’. Photo by Duncan Cole. Related Items:A Midsummer Night’s Dream, Black Grace, Chris Ofanoa, Dance Aotearoa New Zealand, DANZ, InterACT Disability Arts Festival, Kendall Smith, Liam Scarlett, Lumina, Minoi Surface, New Zealand Dance Company, New Zealand Dance News, NZDC, Out of the Box, Queensland Ballet, Royal New Zealand Ballet, The Nelson Arts Festival, The Wine Project, Tracy Grant Lord, Tupua Tigafua, Vaka Siva, World of Wearable Arts, YEP Spring School Just Bros, YEP!